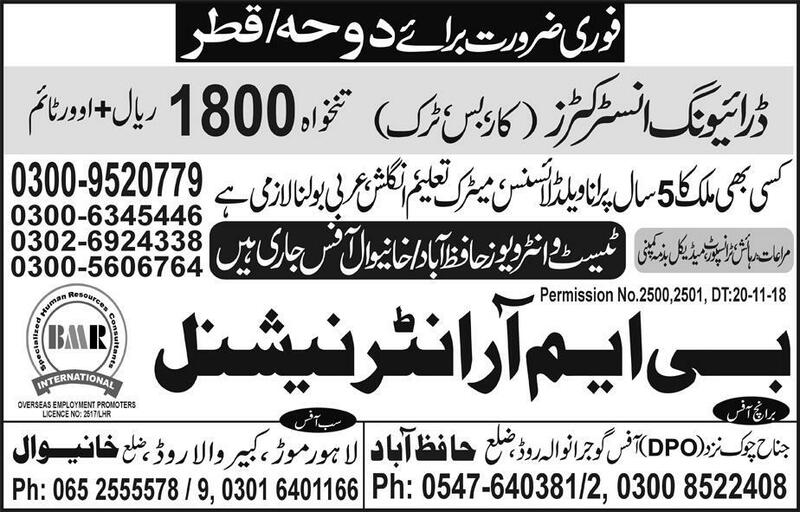 Below are the complete details of the Instructor jobs in Bmr International in Khanewal. Skills Required for Job: Motivational presentation skills. Relationship building . design skills & basic psychology. The ability to show confidence in both yourself and in the task that is given to you. Displaying a positive attitude is vital. By this we mean your physical appearance. A clear and concise manner which shows the character of the instructor is an important indicator of who will make a good instructor. Qualification: Instructor Jobs in Qatar matric pass degree holders & relevant experience in the field & its a temporary basis & male candidates may apply this posts. 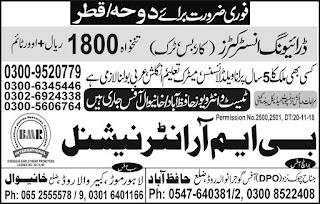 Instructor jobs in Bmr International Khanewal, in Pakistan published on Paperpk.com from newspaper on December 24,2018. Job seekers who are already working as Teacher , Professor , Lecturer , Lady tecaher , School Techer , Female teaching staff can also apply for post of Instructor.